The photography exhibition, whether in a gallery or museum setting, provides an audience the opportunity to experience a photographer’s work as it was conceptualized and conceived. The physical space is activated by the presence and scale of photographs on the wall. 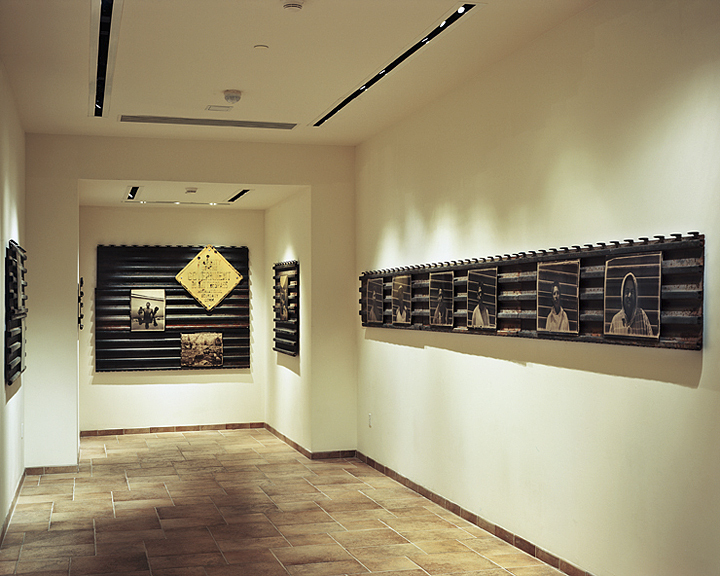 Within the gallery setting, the viewer experiences the completed vision of the photographer’s intentions and efforts – the finished photographic image. The work is considered in relationship to its physicality of scale, whether it be large or small or a combination of sizes. However, because it is viewed in a public space within the context of strangers, the sensation of intimacy with the work can become diminished compared to say a photography book. The Fraenkel Gallery website is a tremendous resource for viewing how they’ve conceived and hung exhibitions. Number of images to be shown. Presentation strategies being utilized (framed works with or without matting, floating mounted works including UV lamination, Plexiglas (Acrylite), and Diasec facing with aluminum, dibond, Sintra, Masonite or Foam core backing, and backlit transparency). For more information, the Laumont Studio website provides an excellent overview on the various presentation strategies. Overall physical dimensions and layout of exhibition space, including running length of wall feet available for the installation, wall height and the layout of walls within the space. Sequencing and overall structure of work in exhibition. Wall backing considerations to determine how work is secured to wall. Lighting considerations – number and type of lights available. Design considerations, including wall and exhibition color schemes, type of flooring, and use of text pieces and exhibition materials that may require the use of display cases, floating/movable walls and/or pedestals. Marketing and promotional considerations, including design and production of exhibition announcement card and/or brochure, and exhibition checklist. Crating and shipping considerations, including how the work will be packaged, installation instructions, domestic and international shipping considerations. Budget, including costs of presentation, marketing and promotional considerations, and crating / shipping / installation considerations. Once these considerations have been accounted for and incorporated into the planning process, the actual preparation in creating the exhibition and space can begin, including the development of a two-dimensional gallery layout, a three-dimensional, scaled gallery model as well as the design of the exhibition announcement card. 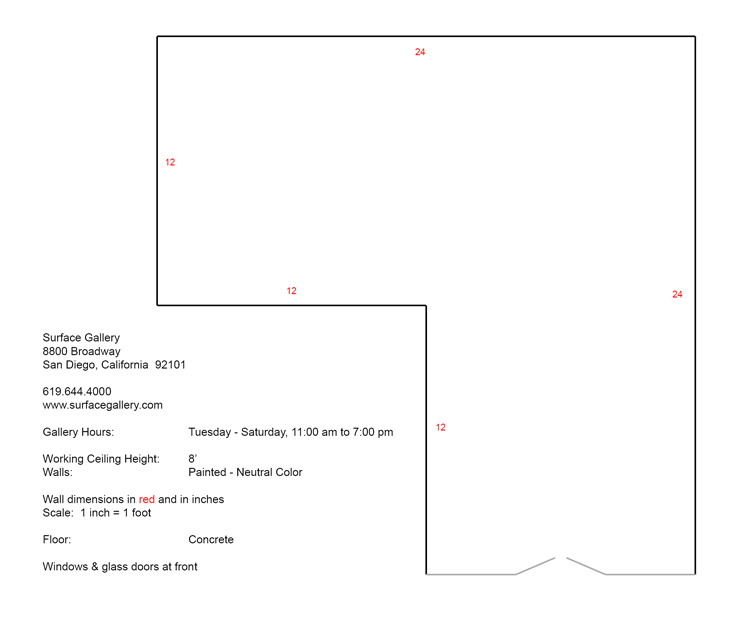 Draw the dimensions of the exhibition space on gridded paper to assist in scaling. Print scale representations of the images / pieces that will be included in the exhibition. Once printed, the representative images can be trimmed out, allowing for movable placement on the gridded paper layout. In Photoshop, create a new document with a grid (under View > Show > Grid). Like the gridded paper, it is important to maintain a sense of scaling when creating the document as well as determining the resolution (it will be necessary to insure that the resolution of the document is the same as the images that will be used later in the layout. 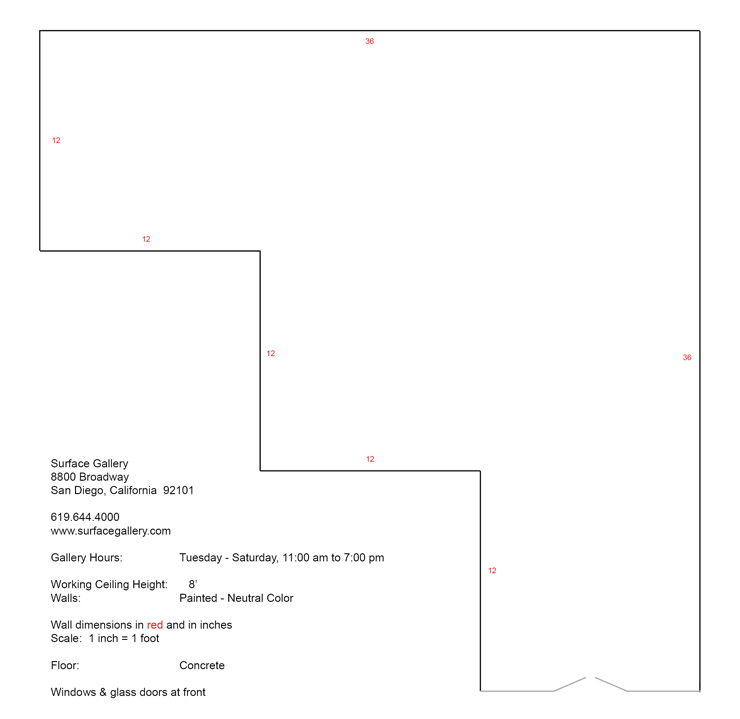 Using the the Line tool, draw the dimensions of the exhibition space. Proceed to scale images and move each scaled image to the layout as a separate layer. With each image being a separate layer, images can be easily moved and multiple versions of the layout can be saved for future review. In addition, the layout can be saved as a PDF file and emailed for review purposes. 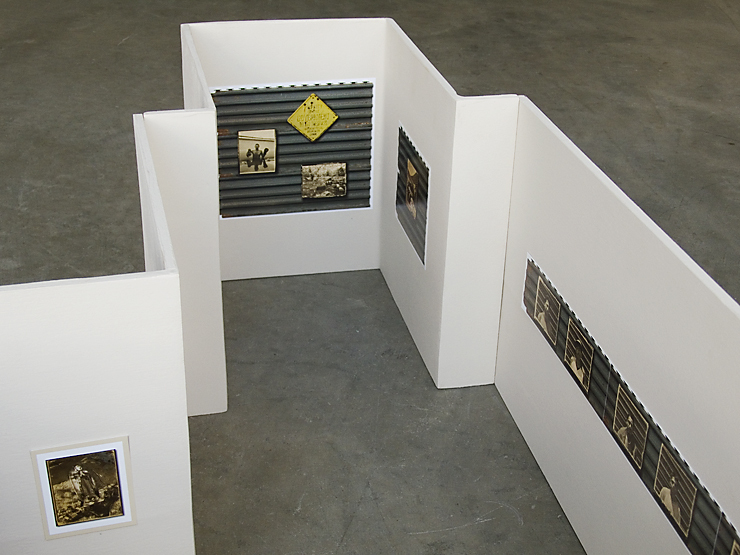 Once a 2-D gallery layout has been developed, it can function as a working document for building a 3-D scaled gallery model, which will provide for a more refined look at how the exhibition will look in a particular space. In addition, the model functions as a reference point for how the exhibition will be installed, including the height and spacing for each piece to be hung and overall structure of the exhibition. 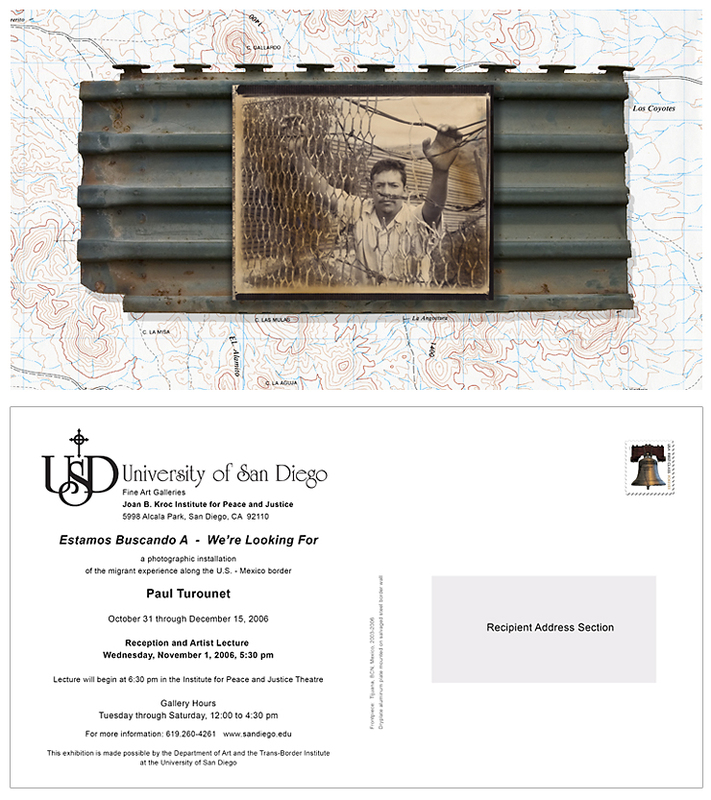 Front and back of announcement card (6″ x 11″ postcard printed by Modern Postcard) for Estamos Buscando A – We’re Looking For exhibition in Joan B. Kroc Institute for Peace and Justice Galleries, University of San Diego, San Diego, California, 2006. The presentation assignment is divided up into two parts – constructing a scaled exhibition space model and an exhibition announcement card. 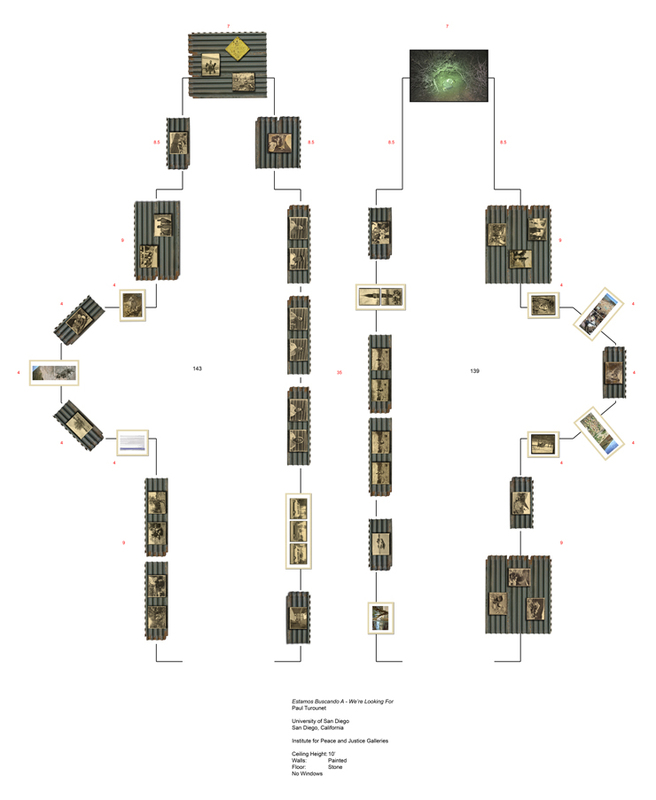 Develop an exhibition based on work being produced for the final photographic print portfolio (15 – 20 images) and construct a scaled model based on one the following exhibition space layouts. The model is required to be made of balsa wood, finished with paint and include representations of the photographs to be included in the exhibition. Be sure to take into consideration the scale of each piece and the sequencing structure of how the work would appear on the walls. The model will be presented during the Final Projects Presentations at the end of the semester. Utilizing templates from the Modern Postcard website, design and print-out the front and backsides of an announcement card for the exhibition and include all pertinent information as described above when designing an announcement card. Scaled exhibition model of an assigned exhibition space with a minimum of 20 representative images from the final print portfolio sequenced and attached to model walls. Exhibition checklist (numbered to corresponding exhibition sequence), including the title of work, date created, medium, dimension (height x width in inches). Print(s) of the front and backside of an announcement card based on templates from Modern Postcard. The exhibition space model and announcement card will be presented along with the final print portfolio at the end of the semester.